This article was originally published in 2018 following its 19th anniversary. Slight modification is made below for its 20th anniversary. 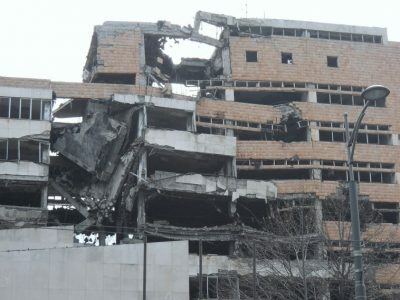 Twenty years ago, on 23 April 1999, a NATO missile attack on Radio Television of Serbia (RTS) headquarters killed 16 employees of the state broadcaster. The forgotten war crime occurred during the Kosovo War (March 1999-June 1999), and was part of NATO’s aerial campaign alongside the US-backed Kosovo Liberation Army (KLA) a paramilitary entity with links to Al Qaeda and organized crime , in opposition to the Federal Republic of Yugoslavia. In the aftermath of the attack there were no great public campaigns launched for the 16 murdered journalists and employees, no outpouring of emotion for those killed, no calls for solidarity and togetherness in the face of aggression. On the contrary the West justified this grievous blow against freedom of expression, praised it even. Tony Blair, Britain’s then Prime Minister, welcomed the killings when speaking at NATO’s 50th anniversary summit in Washington. Blair said the missile attack was “entirely justified… in damaging and attacking all these targets”, and that those murdered were part of the “apparatus of dictatorship and power of [Slobodan] Milosevic”. Blair felt that, “the responsibility for every single part of this action lies with the man [Milosevic] who has engaged in this policy of ethnic cleansing and must be stopped”. Apparently Milosevic “must be stopped” by wiping out state journalists or what Blair describes as an “apparatus of dictatorship”. According to one of the main leaders of the Western world, Milosevic must bear full responsibility for a NATO fighter plane firing a US-made missile on a state broadcasting service’s headquarters. Perhaps we shouldn’t be too surprised by Blair’s visions of justice, particularly when examining his key role in the deaths of hundreds of thousands of Iraqis in the following decade. “the propaganda machine is prolonging the war and it’s a legitimate target”. Short is a Labour Party member and her official title today is The Right Honourable Clare Short. Defending these killings was neither right nor honourable one can assume. “a legitimate target which filled the airways with hate and with lies over the years”. This followed on from a number of other NATO attacks on radio and television outlets in the country. In the build up to the 2003 Iraq invasion, Cardiff University revealed that the BBC adopted the most pro-war stance of any British network. The official reasons for invading Iraq were based entirely on lies and misinformation. In this case was the BBC “the propaganda machine”, had it become “a legitimate target” too? “Serb TV is as much a part of Milosevic’s murder machine as his military is”. “an enormously important and, I think, positive development”. In the build up to the Iraq invasion American networks like Fox News were styling the illegal intervention as “Operation Iraqi Freedom”, with its correspondents and news anchors compelled to repeat that phrase. In addition a permanent American flag was fluttering in the top corner of the screen, and during the invasion itself the banner “war on terrorism” was unfurled. Did this make Fox News and others like it, “a legitimate target which filled the airways with hate and lies”? Judging by the standards of Western elites, one would have to suggest so. Meanwhile, a single person was charged for the attack on RTS: Dragoljub Milanovic, the Serbian network’s general manager, who received a 10-year jail term for failing to evacuate the building in time. Yet the International Criminal Tribunal for the former Yugoslavia concluded that NATO’s bombing of RTS was not a crime, noting that deaths were “unfortunately high, they do not appear to be clearly disproportionate”. Clearly disproportionate to the overall number of civilian deaths inflicted by NATO perhaps. However, in January 2015 the Western reaction was somewhat different when 12 journalists from the Charlie Hebdo satirical newspaper were murdered by Islamic extremists – along with four Jewish men killed at a kosher supermarket shortly afterwards. “We stand absolutely united with the French people against terrorism and against this threat to our values – free speech, the rule of law, democracy”. Cameron went on, “we should never give up the values we believe in… a free press, in freedom of expression, in the right of people to write and say what they believe”. About two weeks later Blair, now a Middle East peace envoy, said of the thinking behind the Charlie Hebdo attacks, “this extremism is not natural, it’s taught and it’s learned and you have to un-teach it in the school systems”. Blair seems further unaware of his own role in creating “this extremism” by playing the junior partner role in invading Iraq, a crucial factor in the rise of ISIS. In the aftermath of the Charlie Hebdo attacks, millions marched to honour the dead with the slogan “I am Charlie” becoming famous. When the Serbian journalists and employees were killed just over 15 years earlier, there was no international motto of “I am RTS”. New York civil rights lawyer Floyd Abrams described the Charlie Hebdo shootings as, “the most threatening assault on journalism in living memory”. The perception of “living memory” appears to be a remarkably short one. This article was originally published by The Duran in August 2017.